Location: Two Grids at Once! Today, I tested both the SL viewer 1.23 and the latest version of Imprudence Viewer on the machine where I installed the new SL 2.6 viewer. Both worked. There was a moment of concern on the SLED list that the new viewer might disable access to other viewers on one's computer. Clearly that has not been the case for me. I logged on again, with SL 2.6 and Imprudence simultaneously. 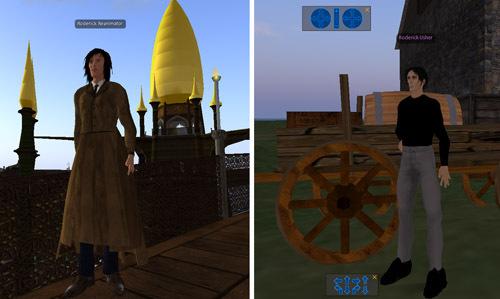 This was the acid test, shown: at right, Imprudence running for Jokaydia Grid; at left, SL 2.6 for SL's grid. I did have to wait for the viewer to auto-download an update. I also noticed that point-and-click movement has stopped working after the update--or is it just me? So far, I've really enjoyed the SL viewer and think Linden Lab addressed issues that bothered me about earlier versions of Viewer 2, namely, that I could not build as easily using the new viewer. Over the summer, time will tell as I use the new Viewer on my primary machine and with my primary avatar.